Tacqueria el Bronco is located on Cherokee Street, an area that is both known for antique shopping and for Mexican culture in St. Louis. St. Louis actually has the smallest Hispanic population of any major U.S. city at 2.6%. The “Mexican district”, at the intersection of Cherokee and California streets, has 3 Mexican restaurants and the El Torito Hispanic grocer. With these demographics in mind, I had pretty low expectations for Tacqueria El Bronco. Yes, it had 4.5 stars on Yelp, but certainly the people rating the restaurant have not been blessed with the amazing Mexican food of the Southwest. Based on recommendations, I ordered the tacos el pastor. While they were not the best tacos I have ever had, they were good and most importantly, they were authentic. 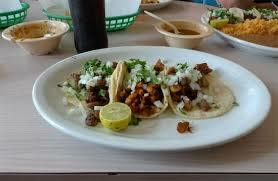 I have been searching St. Louis for the best tacos and Tacqueria el Bronco is probably it. If you are from St. Louis, I believe that this is an important place to visit to get a rare real taste of Mexican culture.